ROAD TOWN, Tortola, VI – The Environmental Impact Assessment (EIA) for the Cruise Pier Development project has found that what was initially suspected to be a ‘dead reef’ is very much alive. These were among some of the many disclosures made yesterday, August 22, 2013 by Executive Director of Environmental Systems BVI, Dr Cassander Titley-O’Neal whose company was contracted to conduct the study. 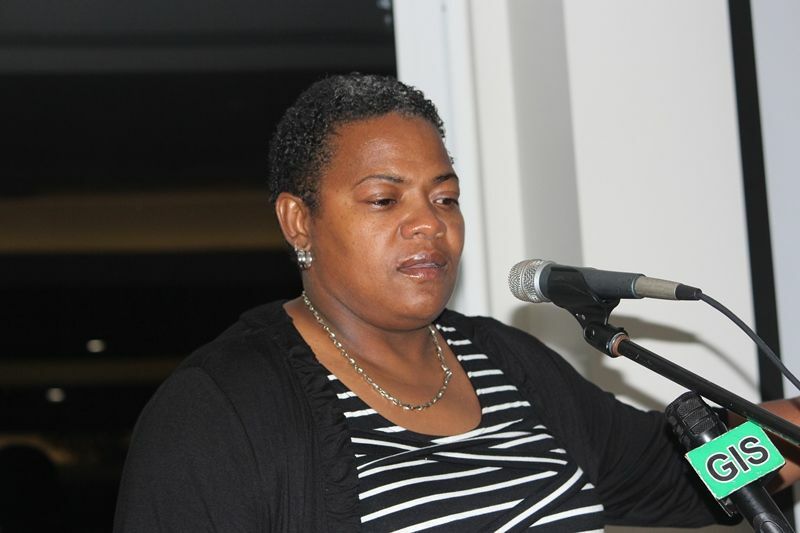 She explained that indications of a ‘dead reef’ located in Road Harbour at the location where a turning basin was expected to be done proved to be false. 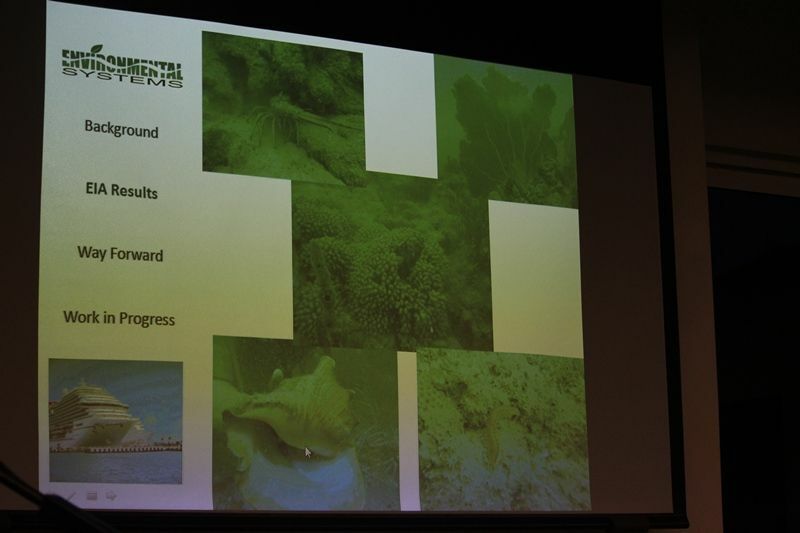 “After diving the area… we realised that the area was not dead but very pretty much alive,” Dr Titley-O’Neal said. In an exclusive interview with Dr Titley-O'Neal, she revealed that she found this to be one of the most surprising aspects of the study that was conducted. The location was also identified as a transitional area for commercial fishes such as the Parrot Fish, in addition to the Queen Conch and Spiny Lobster. She related that the presence of a bristle worm was an indication that the eco-system is one that is starting to catch itself and to thrive and possesses living coral among other life forms. It was related that the dredging was necessary because new ships scheduled to arrive at the pier will require a draft of 30 feet. Currently, she said, the water that is close to the dock is not deep enough to accommodate this. 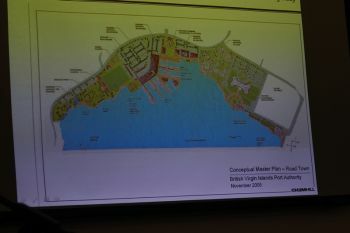 According to Dr Titley-O’Neal, the EIA covered three major components which included the lengthening and widening of the existing cruise pier; the dredging and land reclamation of Road Harbour; and construction of a visitor’s centre. These are in addition to the direct and indirect socio-economic impacts related to the proposed development among other areas. Regarding the social impact aspect of the study, a survey conducted revealed that most people agreed that there was a lack of green and open spaces for residents to go ahead with flying kites, having picnics, etc. Dr Titley-O’Neal said concerns were also raised over the lack of sidewalks, the shortage of public restrooms and overcrowding of popular sites as major problems which were realised as being resultant from the influx of passengers expected with the cruise pier expansion. “Bringing in this many passengers to the Territory, the government would have to do something to build the infrastructure to accommodate these passengers,” she said. She also noted that during the study, it was realised that the Territory’s health services may be overwhelmed in the unlikely event of a disaster that required evacuation of ships. The Department of Disaster Management (DDM) held an exercise in January called ‘Operation Tropic Hit’ which ran a simulation exercise that showed how the Territory and its emergency services would have to accommodate and deal with such an event. 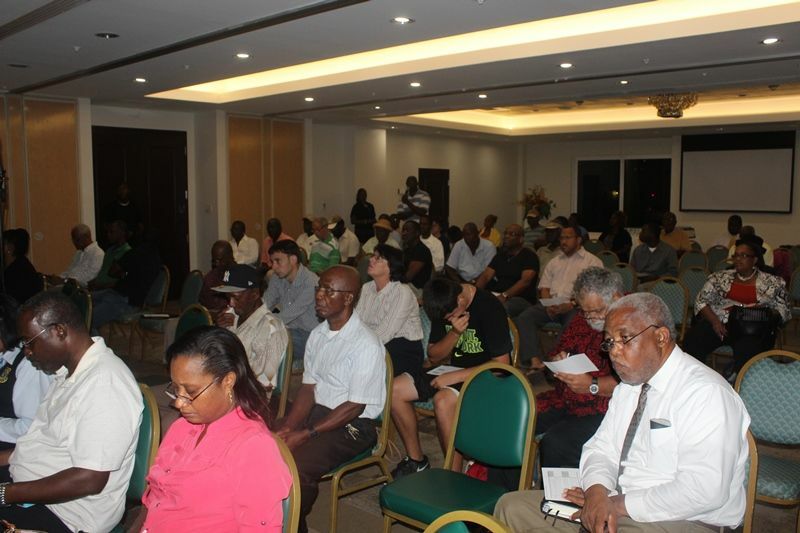 Dr Titley-O’Neal explained that the need for an extension of the cruise pier arose based on data received from the Development Planning Unit (DPU), which indicated a noticeable decline in the number of cruise ship passengers to the Territory. The public survey, which was done for the EIA, can be accessed online by readers at: https://surveymonkey.com/s/bvipareclamation. However, the actual study is not expected to be made available until it has been completed and funnelled through all the appropriate channels. Regarding the way forward, the next step as explained by Dr Titley-O’Neal, is the completion of an addendum which will clarify certain points raised before the document is handed to the Town and Country Planning Department for further approval within three to four weeks. Additionally, this will be followed by the completion of a construction side to the environmental management and monitoring plan which is also expected to take up to a month’s time. this is another done deal so ayo dont waste your time. Back grown and community family we love you . Some places on our island should be left alone to preserve eco-systems. congratulations to Dr Titley-O'Neal for telling it like it is at the risk of alienating government officials. If another popular consultant was used, he would have fudged the report to include "in a perfect world" which would be the only thing officials would read. That consultant would walk the thin line so he wouldn't get fired. Cassander has no quams in telling the truth. What ministers DO with the information is yet another thing. The cruise companies dug BVI a hole by already stating that larger ships would be arriving without even the benefit of the survey. So now what? They forced us into this and chances are, will manipulate the plans for the land-side development which is still begging for realistic engineered plans, measurements, and infrastructure. totally agree with you. the government is being lead by the nose, trying to keep up with "modern" expectations without realizing they are throwing the baby out with the bath water. They are going to ruin the very thing people come to see and experience. Keep Disney off of Main Street. Plus, bigger ships have bigger pollution problems. And we are ill-prepared for the volume of people. Hospital/ health safety is a huge consideration. How can we accommodate 2500 people a day? keeping it small and desirable is the way to go. people who come will feel privileged, not entitled. it is amazing how mother nature compensates for the foolishness of humans and their behavior. Now let's get more of those tires, and trash off the harbor floor. As long as government rerfains from selling the land to foreigners, there could be no environmental threat. A long term lease ought to be in order. People seems to forget we are a tourist destination and what it means to keep inline. want the country to do. I am amaized of the crap adult people write on thses bloggs some times. how do you measure ahead and behind? by how many concrete mega-hotel/resorts there are? how many McDonalds? How many street lights? How about those who charter boats and visit guest houses. you are comparing un-related things (unless you want BVI to look like cruise ship central). I find it interesting that one news site emphasizes "minimal damage to reef" while the other site announces "study finds suspected "dead reef" very much alive". This is the very argument in attitude. Saying 57% support the project is like saying 65% support the hospital. Most people agree with a school, library, hospital, park, parking lot, senior centre, play ground in general. The issue is how it is done, expense, size, timing, design, practicality, waste and impact. The devil is in the details which are often sorely lacking. Do you really think that TCPD will monitor dredging, building, spills, silt containments and mitigation? the cruise ship dock and the immediate 4.5 acres are not the only thing involved. The reclamation in front of Maria’s, part of the 2005 plans by CH2M Hill (a mass-developer from FLA) was supposedly abandoned. And the impacts listed do not give enough assurances to move ahead. We still can't take care of our own trash waste, and we are adding more? The dredge sediments in the harbour have not been screened for contaminants/ pollutants which will be disturbed; do we add more taxis and ferries? ; do we continue to overcrowd Cane Garden Bay and the Baths? : Are we waiting for maritime accidents? Who is driving this bus anyway? The BVI is in the driver’s seat, not the cruise ship industry. Bigger ships will not fix the problem. They will only add to the many problems including water, electricity, sewage we have already. 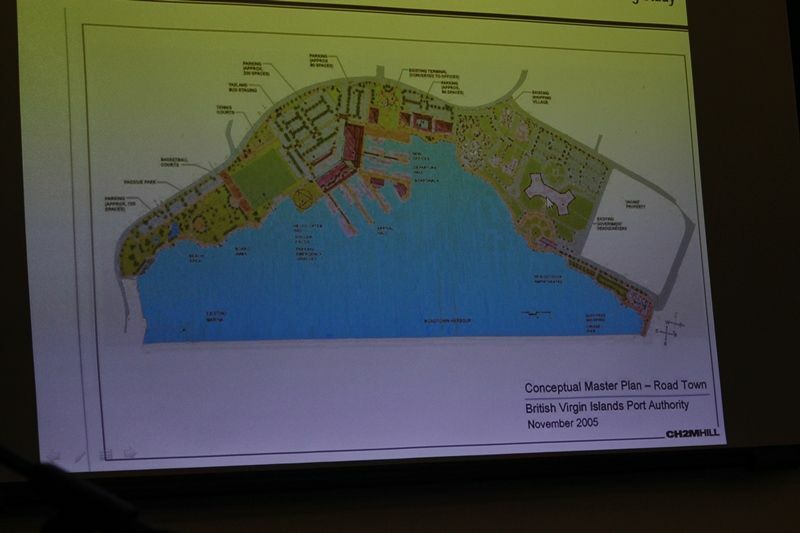 And this dock development is not the only element in the master plan for the harbour. There is not enough room for what is being planned. If you were to the young lady's talk you would know that the dredge sediments have been screened for. What you said about adding to the many problems that was spoken about too. Too many times you all come on the blogs dont go to the meetings and just run ya mouth. Cha!! she repeatedly stated that she could not guarantee that there would be no damage. Most of these consultants, including Cl... Petro..... usually state a best scenario which is the only thing government hears. Things can only work if TCPD (and conservation and fisheries) inspects regularly and holds developers and contractors to legal standards. Otherwise, we will have a Scrub Island situation where stop work orders were issued repeatedly. (then again, stop work orders were also issued for the Cutlass building but that didn't last). All those issues listed were discussed but I am not convinced they were thought through. what about the rest of the reclamation as seen in the master plan picture? Is the reef and harbor bottom going to be disrupted and destroyed with that too? there is a marina planned. If half of oil spills are in the harbor, what is going to keep others from larger cruise ships and other boats docked from contributing? The reef is "very much alive", but for how long?